To Purchase – Simply click on the “buy” button. Available in CD, Digital Download, & Individual Songs thru BandCamp. This album brings back the Old Hymns of days gone by. As you tie up your horse to the church hitching post you will here the old pump organ and singing, Cowboy Style! 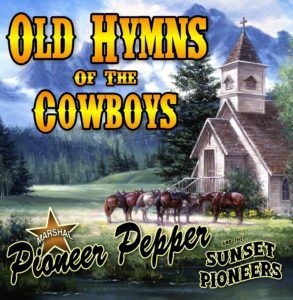 A reverent collection of these meaningful hymns is performed by internationally acclaimed singing cowboy, Marshal Pioneer Pepper and his group, The Sunset Pioneers! Special thanks to artist Jack Sorenson for the use of his beautiful painting, “Friends In High Places”. What an honor! Amarillo artist Jack Sorenson grew up living the scenes of the Wild West that he paints today. As a kid Jack had the run of Six Gun City, a tourist attraction that his dad built, and as a teen worked there as a gunslinger and stagecoach driver. His love of art is similarly deep-rooted: “At the age of six I announced to my family that I was going to be a professional artist.” After Jack’s first one-man show sold out in 1975, he quit his day job as a horse-breaker and began painting full-time.